We will design and develop your workspace to suit your needs ! 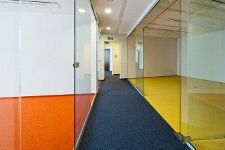 Interbiuro company with its head office in Warsaw offers a wide range of services connected with the office and commercial space fit out work. We carry out and supervise general building and refurbishing work, we install carpets, partition walls and furnishings. Our designs and projects create comfortable and functional places for work and rest. Thanks to our work every space becomes exceptional and unique. We have been running our business since 1999. We are your partner when you need a full-scale service of an office space building process. The coordination of the office space design allows us to control the process of the design phase of the project and the execution of the project (from the client’s requirements to implementation and finishing of the installation work). What differs us from competition?